A few months ago I wrote a post about the times I have received a sign that some choice I have made is the right one. Since I’m not a big believer in signs and portents, I never expected to get another one so soon. 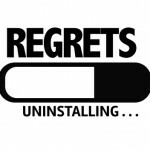 But, I’m glad I did – this one brought much needed healing to my heart over two of my biggest regrets. When going through my daddy’s things after his death, I found a smooth tear-shaped rock on the shelf of the bookcase next to his recliner. His shelves were where he kept items he used frequently and miscellaneous things he just like to have around. This rock obviously fell into the second category. I had never seen the rock before and I don’t know why daddy had it. What was it about it that appealed to him? Was it the shape? The color? I guess I’ll never know for sure. But, I love rocks. Seriously. My hubby seems to think it’s a bit weird but I do. Maybe I should have been a geologist. Possible career choices aside, I immediately claimed the rock as my own. Since it was February and the temperatures were still cool, I stuck the rock in my pocket. I liked having it there. 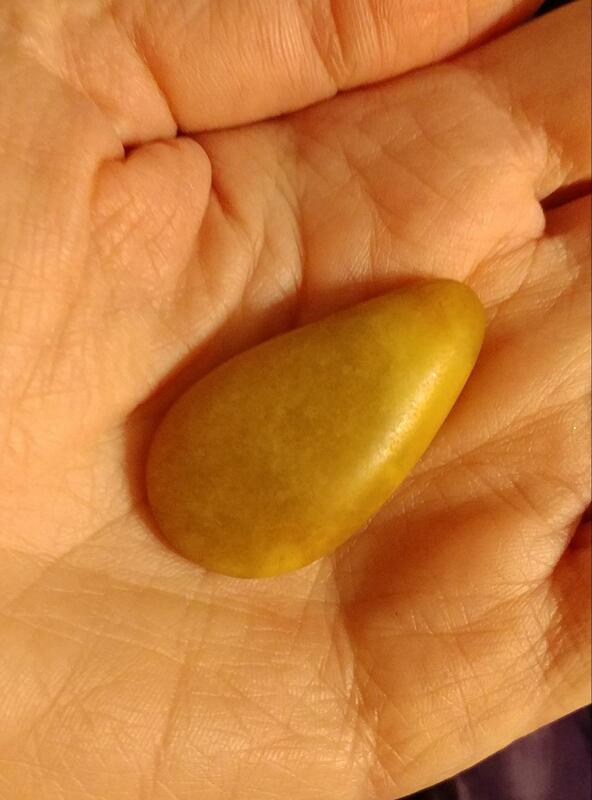 It was soothing, almost like a worry stone. 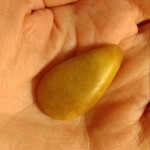 Whenever I put my hand in my pocket, my fingers would close around the rock and I would begin soothing it with my thumb. It was a reminder of my daddy. It brought him close for a few minutes. However, every time I clasped the rock there was also that little voice in my head telling me that I needed to find somewhere else to keep it before it got lost. My jacket is forever getting tossed in the back seat of the car or wadded up in my lap or in the seat next to me at movies and restaurants. It was only a matter of time before something happened to it and I knew I would be devastated when/if it did. Well, the little voice was right and two or three months ago, it finally happened. The rock disappeared. I had no idea where it might have fallen out – the possibilities were limitless. I searched my closet floor and the car with no luck. Every time I put my hand in my pocket, I kicked myself for losing that small connection to my daddy. That was Regret Number Two. It’s hard to believe that it has been two years since my daddy died. My biggest regret about that day is not telling daddy that I loved him. I said “I love you” every time I saw him, but not that day. Why didn’t I? I don’t know. I know without a doubt that my daddy knew that I loved him, but I still regret not telling him one last time. The lesson I hope you take away from this is to always, always say the words: “I love you.” It doesn’t matter how many times you’ve already said it – you never know when you may not have another chance. When you got there to see him, you leaned over and kissed him on the forehead. I think that counts as much. I have no recollection of doing that, but knowing that I did made me feel so much better. While I was still fighting back tears, we made a pit stop to get get out and stretch our legs. When we got back to the car I opened my door and there, on the floorboard on the passenger’s side of the car – where it had not been earlier – was my teardrop-shaped rock. I remember gasping out the words “My rock!” I then grabbed it, clutched it to my chest and began sobbing. This was ugly crying at it’s finest. My husband had no idea why I was sobbing so I finally managed to give him a broken explanation in between sobs and gasps for air. We then had to make another stop for tissues since I only had one in my purse and it stood no chance against waterworks of the type I was producing. Finding my rock at any time would have made my heart happy. Having it given to me then, when my heart was aching over not telling my daddy that I loved him, was more than I would have ever dreamed. Whether it was a gift from my heavenly Father, my earthly one, or the two of them working in cahoots, it served its purpose. My heart is healed, my regret is gone. My daddy knows that I loved him and even if I didn’t say the words on that last day, I told him with actions. There is much truth to the staying that actions speak louder than words. And yes, my rock is now in a safe place. This entry was posted in Life and tagged daddy, grief, grieving, here's your sign, i love you, loss, portents, regrets, rocks, signs. OMG Izzy, you made me cry! 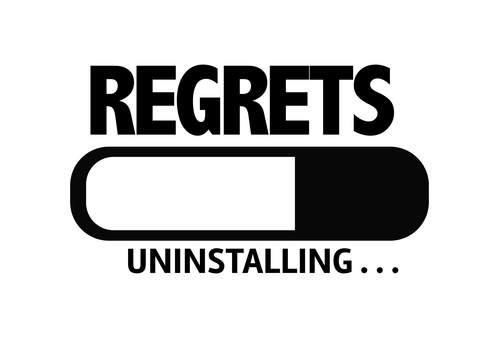 I found out a lot of horrible things that my husband did while we were married about 10 years after he passed away. I found a way to access his computer and found out so much, it devastated me. About a year later I had a dream of him (which wasn’t something I did enough of) where he stood in front of me as I yelled at him for all the pain he had caused me (the biggest was he told he’d be with me forever and he passed away 2 1/2 months after we married). He just stood there, no excuses, no explanations, he just allowed me to tell me how I felt and then he hugged me and I woke. I felt so much lighter and felt better than I had in so long. I felt it was him apologising. A good friend of mine died unexpectedly several years ago. Afterward, I dreamed of him regularly. He would show up in my dream and I would say, “What are you doing here? You’re dead!” He would agree with me and then we would talk and catch up on each others families. After about two years, the dreams stopped. I guess we had said all we needed to say. I think our dreams help us find the closure we didn’t or couldn’t find when our friends and/or loved ones died.